Former Flyers forward Wayne Simmonds. Typically, when the team with which you just made a trade is being praised from all sides, that's not a good sign for your club. And that's exactly what's happening today with regards to the Flyers and the Predators, who made a deal just before Monday's NHL Trade Deadline. The Flyers sent veteran forward Wayne Simmonds to Nashville for Ryan Hartman and a conditional fourth-round pick, which is not nearly what GM Chuck Fletcher was hoping to net in return for one of his most desirable trade chips. Unfortunately for the Flyers, there wasn't much they could do about the haul — other than opt to stand pat, of course — because the market for forwards like Simmonds had been previously set. It's part of the reason ESPN's Emily Kaplan and Greg Wyshynski lumped every team selling forwards at the deadline under the "Losers" category of their deadline winners and losers post. Interestingly enough, nearly every site out there — including ESPN, CBS Sports, Yahoo!, and even SportsNet up in Canada — listed the Predators as a deadline winner. The Flyers? Not so much. But, hey, at least all those sites didn't list them as a loser. We already know that ESPN listed the Predators as one of their winners, so before we get to the Flyers side of things, let's look at what the Predators gave up. Emily rewarded the Predators with a B-plus for this deal by giving up a guy that by all accounts had quickly worn out his welcome in Nashville. The return is less than expected. Though Philadelphia might have hoped for a first-round pick in return, Simmonds' so-so production this season -- and his non-production over the Flyers' past two playoff series -- dropped the price. (Simmonds also had some trade protection, which limited their options). The Flyers should have at least secured a second-rounder, though, or even a third. The silver lining? The fourth-rounder should become a third-rounder, barring a Predators' upset in the first round of the playoffs. But it would be better to have that secure. Over at The Athletic, the Flyers get the second worst grade in their division. The only one worse was Islanders, who stood pat at the deadline (when they should have been buyers) and received a C-minus. ... at least it's slightly better than the first two grades. To no one's surprise, the Predators and GM David Poile undoubtedly were in the mix for Artemi Panarin and Mark Stone. And while those blockbusters never materialized, Poile did manage to turn Kevin Fiala and Ryan Hartman into Mikael Granlund and Wayne Simmonds. Not bad. More on Granlund below. But Simmonds, 30, was one of the deadline's most sought-after rental forwards for a reason. With 16 goals, he packs offensive punch Nashville needs for the playoff run and can boost a power play that ranks dead last in the NHL (12.6 percent). Hartman, 24, was a nice acquisition at last year's deadline, but he hadn't carved out much of a role offensively for the Preds. The draft pick gets bumped to a 2020 third-round pick if Nashville wins one round in the 2018-19 playoffs. It's a price Poile was more than willing to pay. So why make the deal? 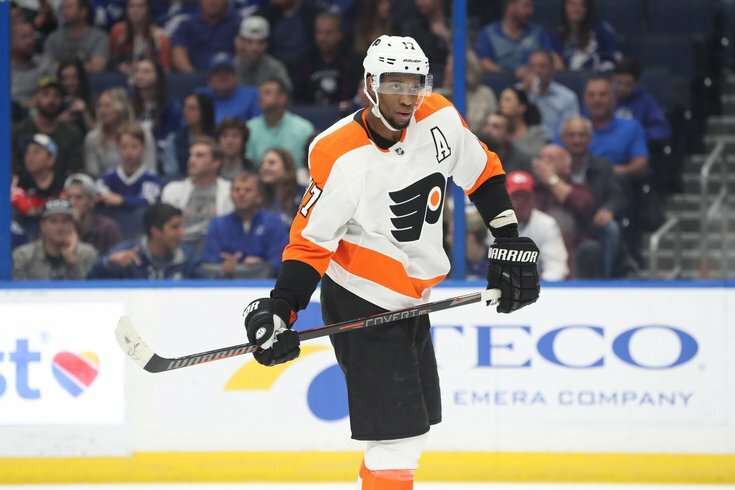 The Flyers general manager met with the Philly media on Monday following the Simmonds trade and explained why they ultimately felt this was their best option. Once again, a lot of it had to do with the market set earlier in the day by other trades. The Flyers received an underwhelming return of forward Ryan Hartman and a 2020 fourth-round pick, which becomes a third-rounder if the Predators win one round in the Stanley Cup Playoffs. Fletcher rejected any previous reports that Simmonds turned down a trade as part of his 12-team no-trade clause. There was an expectation that a Simmonds deal could return at least a second-round choice and a top-quality prospect, but Fletcher was looking for someone who could step in and contribute right away. It is a better team now after a pair of Poile deals that broke in the last half hour before Monday’s trading deadline. Good enough? We shall see. The Predators weren't the only Western Conference contender that upgraded Monday. The Predators’ fate still largely rests on a lot of proven guys rediscovering their best games – and on the power play, which has stunk all season, stinking less in the spring. But Poile did work. He sent Kevin Fiala to Minnesota for Mikael Granlund, a swap of top-six forwards that will leave it to Granlund to help revive the Predators’ second line. And at the last second, he got bruising forward Wayne Simmonds from Philadelphia for forward Ryan Hartman and a fourth-round pick (a third-round pick if the Predators win a playoff series this spring) in 2020.